This activity is great for children who are starting to read advanced code, but still need practice decoding, visualizing, and reading for meaning. The kit consists of nine 8"x 6" cards each bearing twelve pictures with a common sound. The oe card is pictured above as an example. Each picture has a corresponding word card. 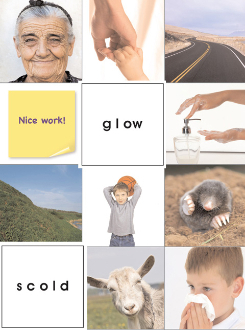 The children read the word card, search for a picture that shows what they've just read, then match the word to the picture by placing the word card over the picture. Glow and scold have been matched in the example above. Includes 108 pictures and words for eight sounds and vowel plus e.